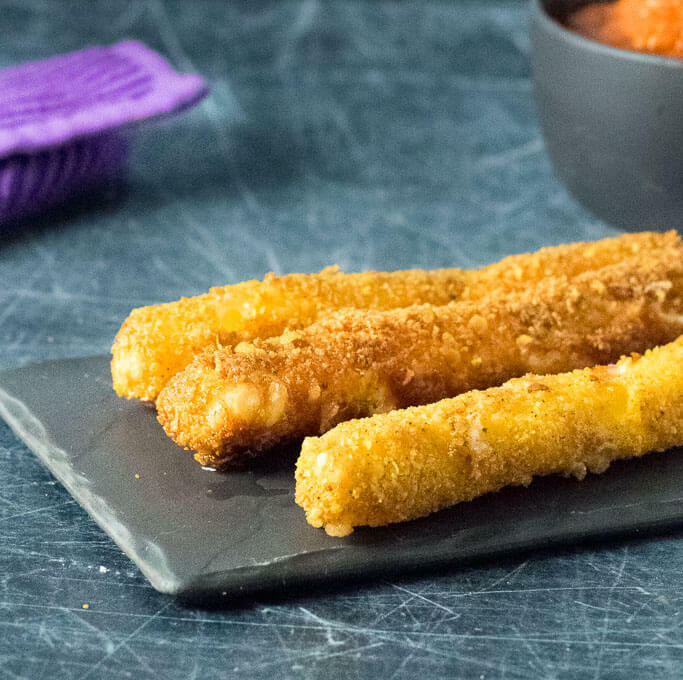 Crank up your boring appetizers with these melty Doritos Mozzarella Sticks made with string cheese and coated in a crunchy crust of crushed Doritos. I had these Doritos Mozzarella sticks on my menu since last week, but the universe blew up in my face. I hurt my back, my wife’s car stranded her with a flat tire and no jack, and I fell way behind on my remodeling project. Luckily the weekend gave me time to catch up to life and my wife and I enjoyed this twisted appetizer as a Sunday treat! I have to give one of my reader’s credit for this idea. He came across my Homemade Mozzarella Sticks recipe and left me a comment saying he made them with Doritos instead of using my recommended breadcrumbs. I thought that was ingenious so I put it on my to-do list for the past year or more but kept putting it off. However, it was worth the wait! First of all, whenever I make homemade mozzarella sticks, I always use string cheese. It is already perfectly portioned in the classic mozzarella stick shape. No need for cutting, sizing, or slicing. Simply separate the sticks and then proceed to dread them in the batter and coating. 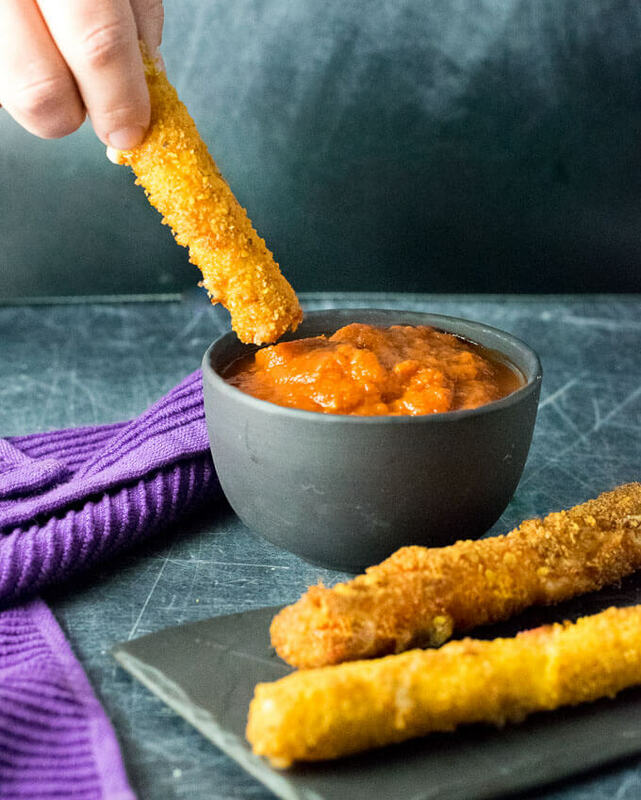 Using Doritos to coat your mozzarella sticks is not only a fun twist on the classic appetizer but also a great hack if you are looking to figure out how to make mozzarella sticks without breadcrumbs. The key is to crush up the Doritos into a fine consistency similar to breadcrumbs. If the chunks are too large they won’t stick to the egg coating on the mozzarella string cheese. You can place the Doritos in a bag and pound them with a meat mallet, however, I find using blender (affiliate link) to be infinitely quicker and easier. Tip: I don’t typically add all of the crumbs to the dreading dish at once, I reserve some back in case the crumbs begin to clump up, then I have fresh ones ready to go! If you are wondering which Doritos flavor is best to use, Cool Ranch and Nacho Cheese both turned out great. Use your favorite flavor. Less is more when frying Mozzarella sticks. The cheese melts incredibly quickly. I always recommend frying a test stick before you fry up the rest of the batch. This will show you how quickly your cheese is melting in comparison to your oil temperature. If you leave them in hot oil too long they will fall apart and turn to goo when you try to remove them. Simply fry long enough to brown the coating then remove from the oil. I recommend frying Mozzarella sticks in hot oil around 365 degrees for 45 seconds. Crush Doritos in a blender until they have the consistency of breadcrumbs and pour into a dish. Add eggs to a separate dish with milk, whisk to combine. Heat a couple inches of oil in cast iron skillet to 365 degrees. Dip string cheese into egg mixture and turn to evenly coat. Then dip in Doritos, turning to evenly coat. Working in batches place breaded string cheese into the hot oil and cook for about 45 seconds. The crust should brown slightly, but the cheese should not fall apart. The cheese melts fast, do a test stick first to ensure you do not overcook them all. Let cool on wire rack briefly and serve with warm marinara sauce. IF YOU LIKED THIS RECIPE you need to check out my Beer Battered Cheese Curds recipe too! 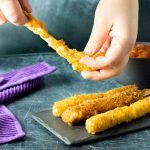 If you enjoyed my Doritos Mozzarella Sticks with String Cheese recipe then you should probably like me on Facebook and follow me on Pinterest too. That’s what I would do at least, because if you don’t get to know me but you still use my recipe it is kind of like taking candy from a stranger, and your mom taught you not to do that. Don’t disobey your mom, subscribe to Fox Valley Foodie today. Yes! This is what I am talking about!